A brushfire that broke out in the central area of Camp Pendleton Sunday quickly spread to more than 1,000 acres by evening. 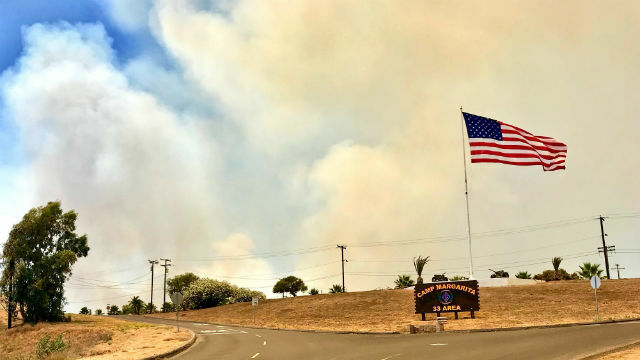 Officials at the sprawling Marine Corps base tweeted around noon that a three-acre fire had broken out on Wilcox Range. About an hour later, they announced the fire had spread to about 100 acres, and by 3:30 p.m. it was more than 600 acres. Around 7 p.m., base officials tweeted that the blaze had swelled to 1,000 acres with 50 percent containment. It wasn’t immediately clear if any structures were threatened on base. North County Fire Protection District officials said there was no threat to lands in their jurisdiction area off the post. Smoke from the blaze settled over Southwest Riverside County by late afternoon but there was no immediate threat to structures.